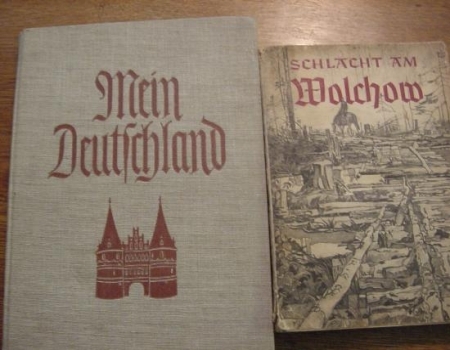 On the left is a couple of books, the first is titled Mein Deutchland or My Germany. This book is dated 1937 and was printed in Berlin. It is a picture book of the German landscape and people. Next to it is the book Schlacht am Wolchow or Battle at the Wolchow is the title of this Nazi photo book on the battle at the Wolchow river near Leningrad in 1942. This book was edited by the Propaganda division of the Nazi Wehrmacht and printed in 1942. The book includes dozens of full page black & white photos that give a good impression of the hard winter battles that the German Wehrmacht and Waffen-SS fought in the bitter cold Russian winter war of 1941 and 1942. Also, the book includes many close-up photos of Nazi German war equipment and winter uniforms. 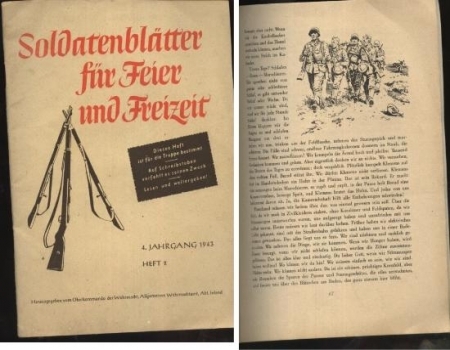 On the right is a 1943 book titled, Soldatenblätter für Feier und Freizeit or Soldiers leaves for celebration and Leisure. This book is by the Oberkommando der Wehrmacht or Supreme Command of the Army. On the left is a book titled DIE WEHRMACHT or The Army. 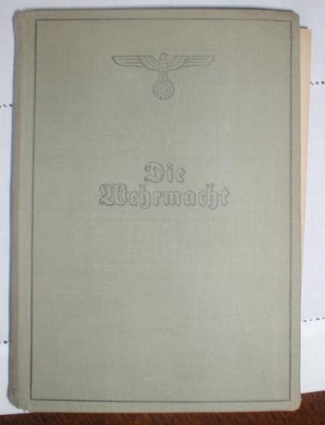 This book by Herausgegeben Oberkommando der Wehrmacht was published in Berlin in 1940. It contains 320 pages with a ton of illustrations. Also inside is a color print of Hitler and one map. On the right is a book titled DIE WEHRMACHT or The Army. This book by Herausgegeben Oberkommando der Wehrmacht was printed in Berlin in 1941 and has 320 pages. 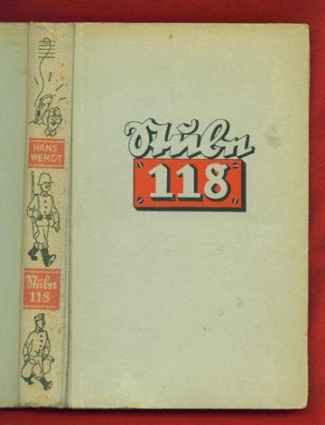 On the left is a book titled STUBE 118. This book was first published in 1937 from the Verlag “Die Wehrmacht” in Berlin, Germany. This copy was printed in Berlin in 1940. It contains funny stories about the new recruits who signed up (or were drafted) in Adolf Hitlers Wehrmacht. The whole book is nicely illustrated and the headlines of the chapters are written in Sütterlin, the old fashion way of handwriting in German which is almost forgotten today. The size of this Third Reich publication is 6 x 9 inches and it contains 184 pages. On the right is a book titled Jahr Buch Des Deutschen Chemiewerkers or Year book for the German Chemical worker. 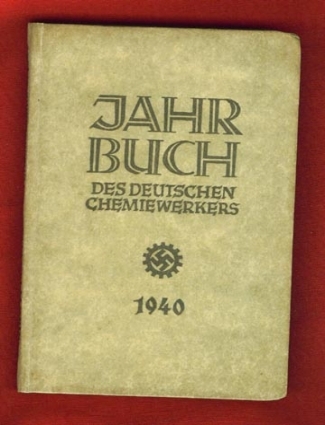 This book has everything which was important to know for the German Chemical Worker in 1940 in the Third Reich who might have worked at the infamous I.G.Farben or at the well known BUNA factories! It was published from the ôVerlag der Deutschen Arbeitsfrontö in Berlin. The size of the book is 4 x 6 1/4 inches and it contains 280 pages. On the left is a book titled Adler Jahrbuch 1942 or The Eagle Yearbook 1942. 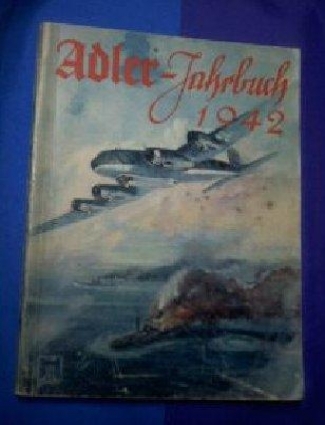 This book is edited by Schriftleitung der Luftwaffe n Illustrierten Adler. This book was published in Berlin by Scherl in 1942. It is a soft cover and the size is 8 7/8 x 6 3/4 inches. The book contains 170 pages and 11 leaves with ads such as those by Mercedes-Benz, Messerschmitt, Heinkel, Focke-Wulf, Junkers, Dornier and many more. It also has a calendar of 1942 and tons of pictures and illustrations in the text, some being full paged. 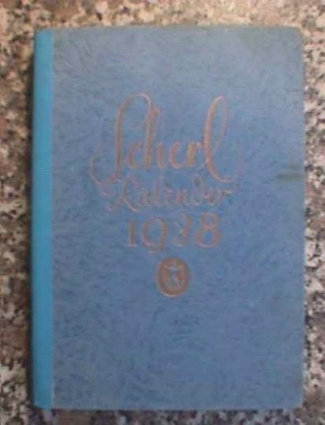 On the right is a book titled Scherl Kalender 1939. This is some type of calender book with lots of ads and pictures as well as a calender of the months on different pages. It contains 270 pages. On the left is a book titled Die soldatische Tat or The campaign in the west. Written by Breichte von Mitkämpfern des Heeres im Westfeldzug 1940. This book was edited by "Oberkommando des Heeres". 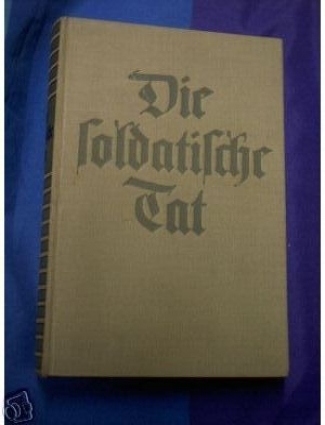 This book was published in Berlin by Im Deutschen Verlag in 1941. It is a first edition. The size is 8 7/8 x 5 7/8 inches and it contains 294 pages and 62 pictures taken from photographs on plates. On the right is a book titled Zum Endkampf gestellt or For the Final Battle. 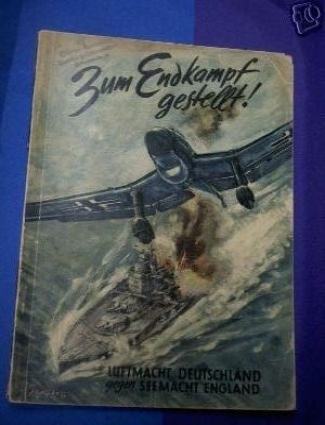 With a subtitle of Luftmacht Deutschland gegen Seemacht England or German Air power against Englands Navy. Written by Hans Georg Schulze. 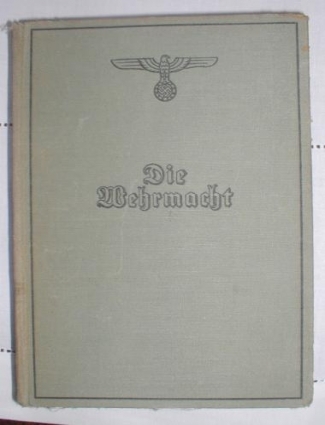 This book was published in Berlin by "Die Wehrmacht" in 1940. It is a soft cover book that measures 8 3/4 x 6 1/4 inches and contains 88 pages. This book has a lot of pictures taken from photographs and illustrations, some being full paged and in color. Some maps presented in this book are quite detailed. Also in this book is three colored pictures that are about the Focke-Wulf-Zerstörer FW 187, that was first used in Norway. 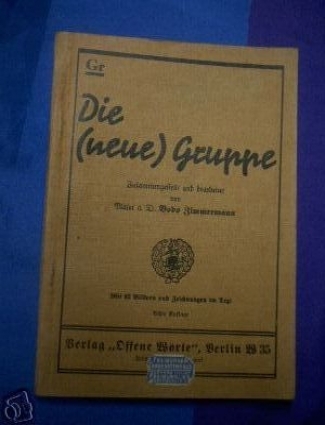 On the left is a book titled Die (neue) Gruppe or The (new) Group. It is by Zimmermann, Bodo. GR. and is the 8th edition. This book was published in Berlin by Offene Worte. I can find no date but believe it to be around the 1935 through 1938 era. This is a soft cover book that measures in at 7 1/2 by 5 1/8 inches and contains 120 pages with 82 pictures and illustrations. The photograph on the left shows four small books. They are not much more then a inch long.